Self-catering Gîte with 8 bedrooms and 10 bathrooms. Sleeps 16. Non-applicable changeover. Self-catering Apartment with 0 bedrooms and 1 bathrooms. Sleeps 3. Saturday changeover. Self-catering Maison de Maître with 5 bedrooms and 4 bathrooms. Sleeps 12. Saturday changeover. Andernos Les Bains is found in Gironde in the Aquitaine region of France. The closest airport to Andernos Les Bains is Bordeaux Airport (31 km) also nearby are Bergerac Airport (128 km), Biarritz Airport (145 km), or Angouleme Airport (150 km). 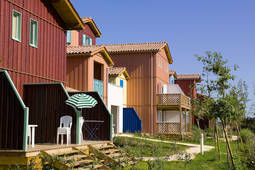 Close to Andernos Les Bains tourism destinations like as Dune du Pyla - Arcachon (18 km), Church of St Radegonde, Talmont, Charent Maritime (89 km), Troglodyte caves at Meschers (91 km), or Les Antilles de Jonzac (93 km) may appeal. See our directory above for more visitors information and advice on places to stay nearby or you can jump straight to places to stay in Andernos Les Bains or take a look at property in Andernos Les Bains. If you do visit Andernos Les Bains leave a recommendation using the link above, we would love to hear from you and other users will appreciate your knowledge. I you are looking for ideas other than Andernos Les Bains we have a great selection of accommodation in France and also real estate in France	if you require it. Alternatively you might consider Golf Holidays In France and holiday cottages in southern france or French Connection Holidays. A few queries we have received from others related to visiting Andernos Les Bains in France include Aquitaine, Sell Vacation Property In Aquitaine, cottage south west france.